Jerome Wetzel TV: Is It SAFE? Article first published as TV Review: SAFE on Seat42F. NETFLIX recently added a French series to their drama lineup called SAFE. While it is technically a production of France, the series is set in Britain, the characters speak English, and Netflix is carrying it globally. 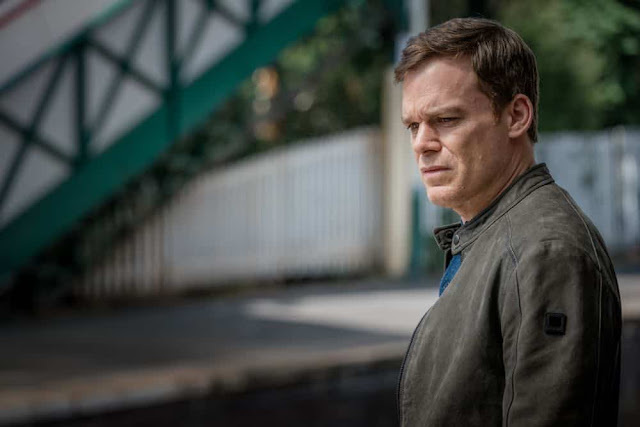 It also stars a familiar face to the United States, Michael C. Hall, so it is plenty accessible to an American audience. SAFE feels like a typical British crime show. It is eight episodes long, with an ongoing story confined to a single season. (I assume; I’ve only watched six of the eight hours so far, but that’s the typical pattern for such a show.) The parent-looking-for-child plot is a common one in recent memory. The characters are more complex and the story more compelling than an American procedural, but it’s still a relatively formulaic structure that matches other similar shows. What is a bit unique about SAFE is how many dark secrets are harbored by all the residents of the gated community in which the series is set. It reminds me a bit of J.K. Rowling’s The Casual Vacancy, except because of the narrowed point of view (the series mainly following two characters), the audience is less clued in until the twists reveal themselves to one of the protagonists. A good number of these twists fit together in surprising ways. It seems a well-thought-out series, with defined characters who serve specific purpose, tight in its execution. The storytelling is mostly linear, but there are occasional flashbacks to give us pieces of the puzzle. These are handled well, natural to the way the investigation is unfolding, and don’t feel forced or gimmicky. Dividing each episode into “Day One,” “Day Two,” and so forth is actually more misleading, as the installments aren’t confined to a day, even in the present-day story line. The inclusion of those words at the start is unnecessary and awkward. Many reviews of SAFE have complained about Hall’s atrocious British accent, so I won’t go there. I didn’t find it distracting, and Hall is an excellent dramatic actor. His character of Tom Delaney, a man who is obsessed with investigating his daughter’s disappearance despite warnings from the police and his girlfriend not to, is different enough from his Dexter and Six Feet Under characters to feel fresh for him. Even if the role is a bit stock, Hall does it very well. Besides Hall, the second most familiar face is Amanda Abbington, who played Mary in the BBC series Sherlock. She is the second lead in SAFE, a cop who is estranged from her husband and sleeping with Tom. She is also the one doing the official investigation into not just Tom’s daughter’s disappearance, but a murder and a pedophilia charge, as well. Abbington is terrific, and it’s nice to see her in a bigger role after her previous turn. The rest of the cast, while not as recognizable, is also strong. There do not seem to be any weak links among the actors. In fact, many of them leave me wanting more screen time, though in a quick series like this, that won’t happen. At least not unless it comes back for a second season. Overall, I like SAFE. It plays it a little safe (hehe) by sticking to a structure that has been tried and found true many times across the pond. But it also has its own little touches and performances that make it a high quality offering in the genre. If you’re looking for something ground-breaking, this isn’t it. But if you just want a good mystery to pass the time, SAFE is one of the better available candidates. SAFE’s entire first season is available now on Netflix.